Earn 5 SCENE points for every dollar you spend at participating Cineplex Entertainment theatre or online at cineplex.com. To see how we calculated the dollar value of an individual Scene Reward Point, download the Value of a Point PDF below. If you DO NOT have an online SCENE account, visit scene.ca and sign up for an account. 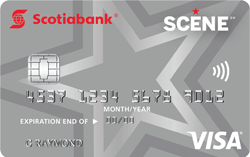 When you sign up for a SCENE credit card, you will also be asked to join the SCENE program online and they will promptly send you a SCENE card in the mail. Once you have your SCENE card number and have set your password, you may log on to view your account and view your Scene points balance. SCENE points can be redeemed in theaters or online at scene.ca for free movies, dining, books, DVDs, magazines, live entertainment, and more.